I was invited to review Healgel intensive and I'm really glad I did! There's a lot of hype surrounding this product and I always prefer to make up my own mind on these things, from the start it was clear to see why there's hype! As soon as it arrived I had to have a go, but it was the middle of the afternoon so I just tried a bit on the back of my hand - instantly my hand was smooth and soft and just looked better than my other hand! I kept saying "feel how soft this hand is!" As soon as I'd taken my make up off and cleansed my face that evening, I popped some on - again, my skin felt softer and just looked clearer - I have some very small broken capillaries on my cheek (a sign of future rosacea like most women in my pale skinned family history) and I felt that these were less noticeable within minutes. I didn't however notice any change in my wrinkles! In the morning, my skin was still soft and smooth. I used Healgel twice a day after a few days I love the results, much clearer, smoother, softer, glowing skin, no noticeable difference on my slight wrinkles though! - I have a frown line and some hints of crows feet. I also used this on my very (extremely) dry knees and elbows (something I get every autumn!) and Healgel intensive really helped - within a few days my knees and elbows were back to normal. It's a very light gel which is non-greasy and absorbs quickly with instant results which do seen to last! It's a Paraben free product and uses nanoparticle technology to penetrate the skin layers. Healgel does not contain the same nanoparticles found in some suncreams which has caused a few safety questions and is a current area undergoing great scientific research and proven results. My skin is quite sensitive and I didn't have any problems with Healgel - actually it helped sooth a patch of irritated skin on my hand! It's now part of my usual skin care routine and I'd recommend it! The first formula to be perfected, and the result of 3 years’ extensive research; HealGel Intensive takes transformative skin care to the next level. The product reflects the founding surgeons’ passion towards their patients’ wellbeing and after care, and the multi-tasking rescue treatment has fast become a cult skin care favourite with many leading health and beauty experts. Originally developed to improve the appearance of scars and relieve bruising and swelling, diminish redness and irritation, HealGel Intensive addresses and resolves a whole host of common skin complaints, such as rosacea, acne, eczema, psoriasis, sensitive skin and sunburn too. It’s also a great emergency repair for stressed skin or when you feel your complexion needs a little extra loving care to restore its radiant glow. HealGel Intensive is a true multi-tasking medicine and beauty cabinet essential. HealGel Intensive is a light, non-oily, aqueous gel, cleverly designed to deliver the most potent active ingredients to the areas where they are needed most to speed skin recovery. Easily absorbed, the naturally cooling peerless skin salve provides a protective barrier which allows the ten intensely active ingredients to work beneath the surface of the skin to soothe, repair and protect. As with the entire range, Arnica and Madecassoside are suspended in liposomes with powerful peptides and biodynes to initiate a uniquely soothing and collagen-boosting process. 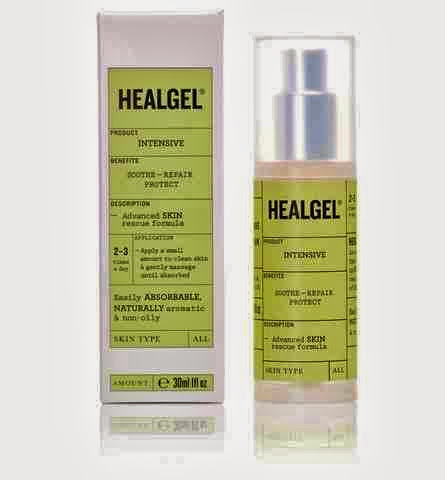 Application: Apply HealGel Intensive to any area of troublesome, unbroken skin, two or three times daily. When used sparingly, this hard-working skin care essential also acts as the perfect base for make up.